Ask the average believer, even most pastors, what they think about Martin Luther and you'll hear nothing but well spoken words. In fact, Martin Luther is still widely recognized as a “hero” of the Christian faith, the father of the protestant movement. It has to make one wonder if people ever read anything other than the newspaper. Tragically, unbeknownst to most believers, Martin Luther was an unsaved heretic who taught damnable heresies until his death. Don't believe it? I'll prove it with Martin Luther's own words. Furthermore, there are MANY Scriptures throughout the New Testament which speaks of others who were also called "“blessed,” with the same Greek word, as was Mary. One example is in Revelation 14:13, “And I heard a voice from heaven saying unto me, Write, BLESSED are the dead which die in the Lord...” So according to the Bible, EVERY born-again believer is also blessed of God. The veneration of Mary is inscribed in the very depths of the human heart. [She is the] highest woman and the noblest gem in Christianity after Christ . . . She is nobility, wisdom, and holiness personified. We can never honor her enough. Still honor and praise must be given to her in such a way as to injure neither Christ nor the Scriptures. No woman is like you. You are more than Eve or Sarah, blessed above all nobility, wisdom, and sanctity. One should honor Mary as she herself wished and as she expressed it in the Magnificat. She praised God for his deeds. How then can we praise her? The true honor of Mary is the honor of God, the praise of God's grace . . . Mary is nothing for the sake of herself, but for the sake of Christ . . . Mary does not wish that we come to her, but through her to God. Indeed, Mary was greatly blessed to be chosen by God to be the vehicle through which the Godhead would become incarnate (Colossians 2:9), but every born-again believer is ALSO BLESSED. God NEVER said anything in the Bible about Mary being ABOVE anyone. Jesus NEVER called Mary His mother. God NEVER leads us in any way to recognize Mary. Though Mary realized that people throughout the ages would call her “blessed” (Luke 1:18), she never thought anyone would be so foolish and idolatrous as to bow down and worship her. To recognize Mary is a sin because it is CHANGING the Word of God into a lie, “Who changed the truth of God into a lie, and worshipped and served the creature more than the Creator...” It is wrong to sing, pray, praise, or worship while including any mention of Mary. Why? Because the Word of God doesn't do it. If God NEVER recognized Mary, nor told us to recognize Mary, then why in the name of common sense would people adore and uplift Mary as being something special? She is not! It's time that people got back into the Bible and stopped listening to their lying Lutheran minister. If Mary was immaculately conceived without sin (as Catholics teach), then why would she need a Saviour? The Truth is that Mary was a dirty-rotten sinner just like any other “good” person (Romans 3:10). I'm sure Mary was sweet, godly, virtuous, and obedient, just as a few Christian women are today; but she was still a sinner deserving of Hell, and she needed a Savior as we see proof of in Luke 1:18. There are good sinners and bad sinners, but we are all sinners. There are some very honest and good people in this world (in man's eyes), but when compared to the inspired Words of God, they fall short and are nothing less than wicked sinners. The Bible proclaims that There is none righteous (Romans 3:10). Mary was a wicked sinner and needed a Saviour, just like anybody else. Mary is the Mother of Jesus and the Mother of all of us even though it was Christ alone who reposed on her knees . . . If he is ours, we ought to be in his situation; there where he is, we ought also to be and all that he has ought to be ours, and his mother is also our mother. (Sermon, Christmas, 1529). Is this what Jesus taught? Who did Jesus claim was His mother? Let's look at Matthew 12:48,49 to find out, “But he answered and said unto him that told him, Who is my mother? and who are my brethren? And he stretched forth his hand toward his disciples, and said, Behold my mother and my brethren!” Clearly, Jesus was once and for all placing to rest the idea of Mary being ABOVE anyone else. Why didn't Jesus just say... “Ok, tell my family to come in.” Everything Jesus said and did was for a purpose. So what was the purpose for which Christ shunned his own earthly family? The answer is simply because Jesus wanted to eliminate the idea that his family was more SPECIAL than anyone else, they were not. Jesus set the example for every believer concerning Mary when He exclaimed, “Who is my mother?” (literally, who is Mary?). So what, Mary's here, big deal. Mary was nothing, just as you and I are nothing! There it is folks! It's that simple! Just believe upon the Christ of the Word of God to forgive your sins. You must have the correct Jesus! The Biblical Jesus is God Almighty (John 10:33), the Creator (Colossians 1:16), the Everlasting Father (Isaiah 9:6). Many people are following another Jesus, such as the Jehovah Witnesses cult, who deny that Jesus is God Almighty. They are antichrists according to 1st John 2:22 because they falsely teach that Michael the archangel became Christ. Jesus said in Mathew 11:11, “Verily I say unto you, Among them that are born of women there hath not risen a greater than John the Baptist: notwithstanding he that is least in the kingdom of heaven is greater than he.” Notice carefully. John the Baptist wasn't just the greatest MAN born amongst women. The Word of God says that John the Baptist was the greatest AMONG THEM THAT ARE BORN OF A WOMEN.” This means of women too. Hence, John the Baptist was the greatest child ever born, over all other men AND WOMEN. This means that John the Baptist was greater than Mary, and Jesus said so. Thus, the least person in Heaven will be greater than Mary. And please note, throughout the entire Bible, Mary was NEVER called the greatest woman born amongst women. The Bible is clear that there was no greater human being ever born than John the Baptist, yet God allowed John to remain in prison until Herod cut his head off. Mary was NOT greater than John the Baptist, yet why don't Lutherans and Catholics recognize John with such devotion and admiration as they do Mary? The answer is because the practice of Mary worship originated in Pagan Babylon, NOT from the Bible. Lutheranism is nothing less than DIET Catholicism. There is NO such foolishness taught in the Bible. Martin Luther was a heretic who mandated that people be baptized and partake of communion to be saved. Furthermore, the terms “holy baptism” and “holy communion” often used by Martin Luther are NO WHERE found in the Scriptures. Biblical baptism and the Lord's supper are only symbolic of the faith in our heart. Baptism identifies us with the Gospel of Christ, thus showing our faith in the Lord's atoning work. The Lord's supper, as even Christ Himself taught (Luke 22:19), was only done in REMEMBRANCE of our Lord, nothing more. Religion magnifies the wrong things in the Bible. False religions, such as Lutheranism and Catholicism magnify baptism, communion, good works, Mary and so forth; But the Bible magnifies Jesus Christ! We are saved by God's righteousness, and not human effort. Man has no part in his own salvation. All the religion in the world won't save you. Getting baptized will just get you wet. Eating the Lord's supper won't bring you any closer to heaven, than eating a Big Mac meal at McDonalds. You need Jesus, plain and simple. Religion is the worst thing to ever happen to this world. Religion wants to fit us with glasses, but the Lord wants to open our eyes. Salvation is NOT found in a religion, but in a Person—the Lord Jesus Christ. Despite the erroneous belief by most Christians that Luther was a hero of the faith, he was an imposter. Martin Luther was truly Martin Loser. We shall see, upon consulting Luther's own writings, that Martin Luther worshipped Mary until his death. Christ . . . was the only Son of Mary, and the Virgin Mary bore no children besides Him . . . "brothers" really means "cousins" here, for Holy Writ and the Jews always call cousins brothers. He, Christ, our Savior, was the real and natural fruit of Mary's virginal womb . . . This was without the cooperation of a man, and she remained a virgin after that. God says . . . : "Mary's Son is My only Son." Thus Mary is the Mother of God. God did not derive his divinity from Mary; but it does not follow that it is therefore wrong to say that God was born of Mary, that God is Mary's Son, and that Mary is God's mother . . . She is the true mother of God and bearer of God . . . Mary suckled God, rocked God to sleep, prepared broth and soup for God, etc. For God and man are one person, one Christ, one Son, one Jesus, not two Christs . . . just as your son is not two sons . . . even though he has two natures, body and soul, the body from you, the soul from God alone. Of course, Matthew 13:55,56 prove them all heretics ... "Is not this the carpenter's son? is not his mother called Mary? and his brethren, James, and Joses, and Simon, and Judas? And his sisters, are they not all with us? Whence then hath this man all these things?" Only a blind fool would claim that these Scriptures refer to a different Mary, when verses 53 and 54 clearly reveal that they speak of Jesus' family. Luther Taught the Immaculate Conception of Mary! It is a sweet and pious belief that the infusion of Mary's soul was effected without original sin; so that in the very infusion of her soul she was also purified from original sin and adorned with God's gifts, receiving a pure soul infused by God; thus from the first moment she began to live she was free from all sin. She is full of grace, proclaimed to be entirely without sin- something exceedingly great. For God's grace fills her with everything good and makes her devoid of all evil. There can be no doubt that the Virgin Mary is in heaven. How it happened we do not know. And since the Holy Spirit has told us nothing about it, we can make of it no article of faith . . . It is enough to know that she lives in Christ. It is the consolation and the superabundant goodness of God, that man is able to exult in such a treasure. Mary is his true Mother, Christ is his brother, God is his father. Mary is the Mother of Jesus and the Mother of all of us even though it was Christ alone who reposed on her knees . . . If he is ours, we ought to be in his situation; there where he is, we ought also to be and all that he has ought to be ours, and his mother is also our mother. Whoever possesses a good (firm) faith, says the Hail Mary without danger! Whoever is weak in faith can utter no Hail Mary without danger to his salvation. Our prayer should include the Mother of God . . . What the Hail Mary says is that all glory should be given to God, using these words: "Hail Mary, full of grace. The Lord is with thee; blessed art thou among women and blessed is the fruit of thy womb, Jesus Christ. Amen!" You see that these words are not concerned with prayer but purely with giving praise and honor . . . We can use the Hail Mary as a meditation in which we recite what grace God has given her. Second, we should add a wish that everyone may know and respect her . . . He who has no faith is advised to refrain from saying the Hail Mary. It is obvious and disturbing that Luther was extraordinarily devoted to the Great Whore of Catholicism. Luther's views of Mary as Mother of God and as a perpetual-Virgin are identical to those in Catholicism. Luther taught the Immaculate Conception, Mary's "Spiritual Motherhood" and the use of the "Hail Mary," just as Catholics do. Luther didn't deny the Assumption of Mary, and was guilty of venerating Mary in idolatry. Catholicism's Mary is a spiritual whore, inspired by Satan to deceive the masses of the earth. Catholicism is over one billion strong today, and a menace to the cause of Christ. The Catholic Church and Lutheranism are prison-houses of religion! Listen friend, there's not a dime's difference between Martin Luther and Catholicism. Lutheranism is nothing more than DIET CATHOLICISM. Luther sinfully idolized Mary, trusted in Baptismal Regeneration and is burning in Hell this moment. But you say, Martin Luther read in the Bible that “The Just Shall Live By Faith.” Yeah, and I can show you on Watchtower.org (the website of the Jehovah's Witnesses) where they claim salvation is by God's grace through faith in Jesus Christ, but they say you also must do works. Satan's greatest weapon is to con people into living the Christian life without ever being born-again. 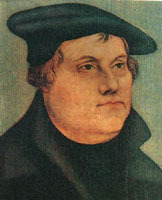 Martin Luther converted from Catholicism to starting his own religion, but he never truly got saved, evidenced by his teachings that water baptism and communion are necessary to be saved. That's not the Gospel by which we are saved. Please read, “What Is The Gospel?” by Pastor Harry Ironside. What's Wrong With The Lutheran Religion?